At Dower House we pride ourselves on the quality of our locally sourced and freshly cooked food. We firmly believe that there really is no substitute for fresh, tempting and individually cooked superb quality food that’s imaginatively prepared and beautifully presented. 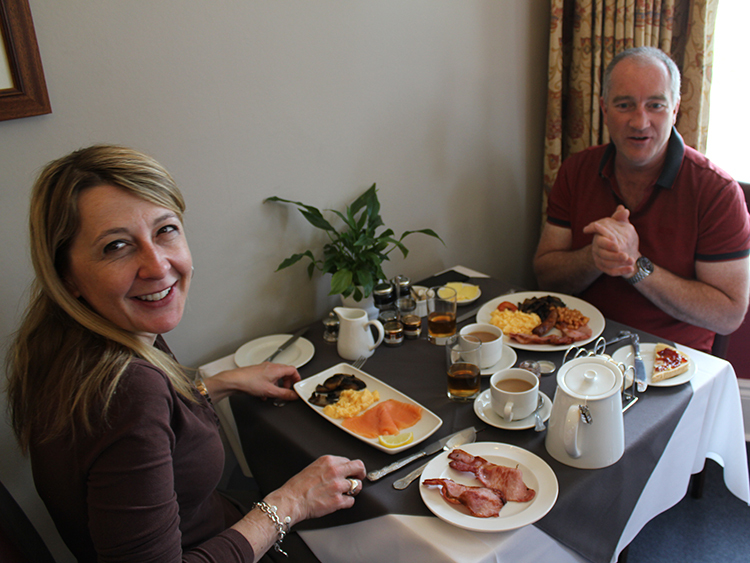 What better way to start the day than a freshly prepared Dower House cooked breakfast? Help yourself to cereals, fruits and yoghurts from our buffet table. 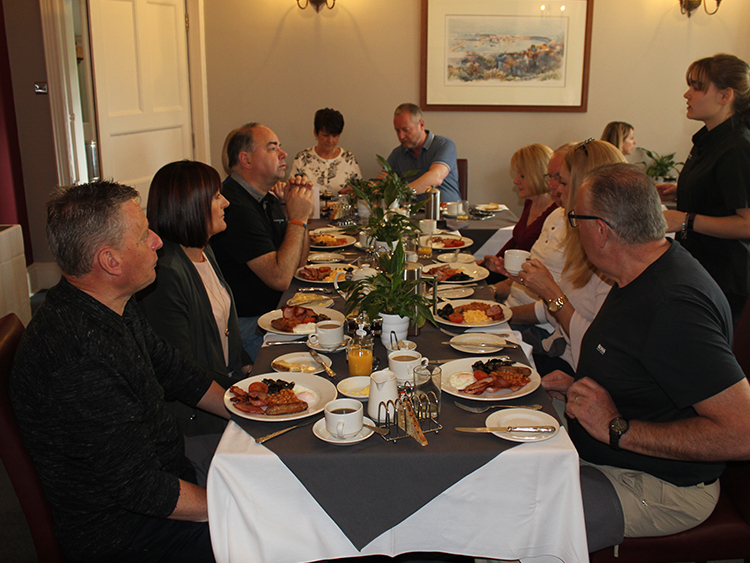 Follow this with a choice of home cooked food such as a traditional full English or a smoked salmon and scrambled eggs, all cooked to order to suit your specific taste. View our Breakfast menu here. Why not come and relax in our intimate and welcoming lounge and bar? The hotel has a fully stocked bar at all times, including a super range of local gins and lager on draft. It’s always warm and cosy in front of our wood-burning stove when the weather is cold or, in the summer time, the sliding doors can be folded back leaving the room open to the beautiful rolling Devon hills. We are pleased to offer our guests selected evening meals with seasonal dishes. We offer good quality home cooking and put our heart and soul into our meal preparation. If you would like to partake in an evening meal during your visit, please give us a call as we prepare everything freshly and we can cook for you upon request – 24 hours notice. If we’re not cooking we’ll be happy to recommend an excellent restaurant in the local area depending on your taste. We are lucky to be situated so close to some of the regions finest restaurants. Whatever your taste you’ll find something to tempt you. Hix Oyster & Fish House (3 miles from the hotel) in Lyme Regis and owned by Mark Hix, enjoys magnificent views over the Cobb Harbour and provides exceptional locally sourced food. Please ask for special rates when staying at the Dower House Hotel. The well known River Cottage HQ run by Hugh Fearnley-Whittingstall, is only 2 miles from the hotel. Why not stay with us when you are on one of their renowned cookery courses or simply when visiting to enjoy their unique dining experience. Please ask for special rates when staying at the Dower House Hotel. Located in the heart of the historical town of Axminster, River Cottage Kitchen is a short journey from the hotel, the River Cottage Kitchen offers the finest the season has to offer as well as a Deli with a seasonal selection of goods. Situated on the beach front, overlooking the Cobb and Lyme Bay, The Harbour Inn offers al-fresco style dining for all the family. Run by Mark and his mother, Sue, this well established, family business provides a dining experience to be thoroughly enjoyed. Tierra Kitchen run by Mark Evans, is all about the quality of the food. Their vegetarian dishes are packed with flavour, while being innovative, healthy and delicious. They serve modern, vibrant dishes with a European, ‘moreish’ twist, using the best local, seasonal and organic produce. Brunch/lunch means freshly prepared, flavour-packed dishes, great coffee, juices and 100% homemade cakes and pastries. Located in the beautiful ancient village of Axmouth in Devon, The Ship Inn run by Graham and Sarah is a family run restaurant and pub featuring a sumptuously varied menu offering locally sourced meats, fresh fish from Lyme Bay, hand-picked crabs from Beer and vegetables from nearby farms. The Ship Inn also boasts a huge beer garden in the back with stunning views out over the River Axe. A former coaching inn dating back to the 16th century, the Tytherleigh Arms run by Mark & Rosie has a fantastic reputation with locals and visitors alike. Serving delicious food their award-winning seasonal menu features the best fresh local produce guarantees a fantastic taste of the west whatever time of year you choose to visit. Their front of house staff are well known for their helpful and knowledgeable service.